From his native South Dakota to LA, Brian Cummings has always had the knack for voices and a love of performing. Along the way Brian was mentored by the legendary Daws Butler of Hanna-Barbera fame. From there, his career took off, landing him national commercials, major promo gigs, & animation series. And what do Brian's many clients say about him? email jeff@DPNTalent.com to work with brian! Imagine a gifted top performer in the VO business, offering a crash course on everything from effective auditions, to taking direction, character development, voice demos, and more... essential tools & techniques to empower students to realize their full potential. 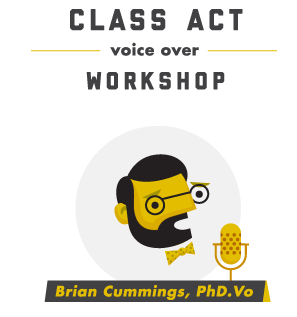 Brian’s intuitive and unique approach makes his Class-Act courses, tutorials, and seminars an absolute must! And before you leave, discover Brian’s original music, both solo and with musical- monster friends, in his band Media Monster. I’m available for voice work, VO classes, fan gatherings, to talk Monster rock & blues, or for just lunch. Feel free to get in touch, anytime.